Campaign Culture, Has Obama's candidacy invented a new language? An interesting premise indeed. You can read more about it here --> http://www.slate.com/id/2194317/. I've been seeing pushes for it recetly (but ignoring them as I tend to do until something forces it into my conciousness). Today's Barack-ism was Baracktogenarian (an Obama supporter over the age of 20). I also saw Baracknophobia recently. All in all, they seem to be silly yet endearing plays on Barack's name either in support or opposition to his candidacy. So, why does this matter? Well, in the American culture of catchphrases (topic of the article that led me to this, also interesting and found here ->http://www.slate.com/id/2194425/?GT1=38001), I know Project Managers who believe they can determine the success of their project by how good it's acronym is. Really...I mean it. One guy decided his project was bound to be a success because the call letters were ANAML (pronounced just like animal, of course) and no one in management would forget that one. And, in Louisiana, the current incumbent's most popular bumper sticker said simply "Dub-ya" playing up his idiocy. If catchphrases and goofy terms bring success, then Barack is a shoe-in. Happy Baracktoberfest! (And hoping for Barackvemberfest and Barackcemberfest and Barackuaryfest)! Baracknophobia? A new language underway? So, I read three stories this morning on msn. Two of them troubled me greatly. The only one I didn't find troubling was the story about Obama helping Clinton pay off her campaign debts (http://www.msnbc.msn.com/id/25357545). This one I found interesting. I find it a bit curious that Clinton's fundraisers would push Obama to do this, but admirable that he'd be willing to ask. If I were a donor (which I'm not, in the spirit of full disclosure) for Obama, I wouldn't give money to pay for a poorly run unsuccessful campaign... But, that's just me. Then I read two stories that trouble me. Really. First, we are treated to the incautious comments of one of McCain's top advisors saying that a terror attack would help McCain's bid for the presidency. Well, at least it falls short of terror mongering a la George Bush. But, how crass and insensitive is it to attempt to make terror a poll boost for your candidate. The cynical side of me wonders if he isn't actually issuing a call to arms to unscrupulous supporters to produce a terror attack that could be blamed on a Middle East faction. That is, after all, just what we need. In a land filled with wonderful, loving, caring people, we really just need another nutcase to execute an attack and elect someone who is old, in poor health, and a continuation of the bad government we've had for the last 8 years in the US, don't we? Read more about it here -> http://www.msnbc.msn.com/id/25357745. The last one, that I find wholly unsurprising but absolutely disturbing is the report coming out of the justice department that the White House interfered with the hiring of new staff to ensure that democrats and those who disagree with the current administration were bypassed. The full story is here -> http://www.msnbc.msn.com/id/25348796/. How petty, low, and inappropriate can you get? No wonder America has gone from the land of the free to the land of the free to agree. I'm embarrassed and ashamed of my fellow Americans that they elected this loser not one, but TWICE. Ashamed I tell you. Okay, MommaBean is now off of her soapbox. Talk about a one-two punch... this morning's news has me deeply troubled. Today I'm praying for the American people, that they are able to make a wise choice. That God softens the heart of whomever is elected. That in fact, the next President will be a healer rather than a fear and war monger. Lord, be with all of those have lost their homes, families, and loved ones. Be with them in their journeys, struggles, and trials. Carry them throughout. Lord, heal those who live with the sense of displacement, uprootedness, and lack of foundation being without a home and a place of belonging brings. Lord, hold those who are refugees (taking refuge) in your hands. Bless the nations that have accepted them and the people who embrace them. Lord, thank you for the UNRWA and all of the many organizations that come together to help meet the needs of these people. Lord, soften the hardened hearts of those who have caused others to take refuge. Help them see the error of their ways and learn to reconcile with their brothers. In Jesus' name I ask all these things, Lord, Amen. So, I was reading an editorial in the Jordan Times about Turkey's Supreme Court calling an amendment to allow the hijab to be worn in Universities unconstitutional. I have no actual feelings on that topic (except that I can't see why it matters so much. If ladies want to wear hijab, why shouldn't they? ), but it did make me think about the practicality of it. In fact, practicality is the only objection I can see to wearing hijab. And not the typical hijab that covers the hair. I can honestly see no objection at all to that. But for the one that fully covers the face, here I can see issues. And, these issues extend not only to university (and other school) settings, but also driving, voting, etc. The reality is that there are situation where you must be able to establish your identity. Taking a test would be an example. Getting stopped while driving would be another... But, rather than outlaw someone's practice of their faith, shouldn't we come up with a better solution? For instance, perhaps you do a fingerprint match on all women who choose to fully veil. When they come in for the test (and if they must leave and return), you check and ensure that their fingerprint is the one on file. The same practice makes logical sense for voting. If you are stopped by a police officer and you fully veil, your license should include your fingerprint. Then, the officer could take your print and verify your identity. This would alleviate concerns about who it is, exactly, under the covering. I guess generally, I think we should use technology to help make everyone free to practice their faith. If they object to using fingerprints, then perhaps they've failed to recognize that you can't be asked to be treated specially and then demand to be treated just like everyone else. What's that old saying about having your cake and eating it too? Anyone else have thoughts about ways that technology could help overcome this challenge? What can we do to bring freedom of worship into the 21st century? 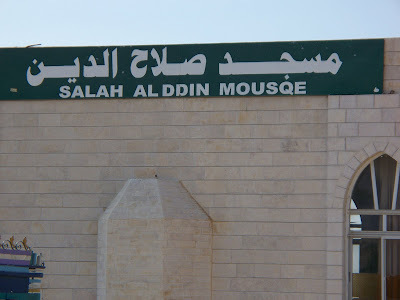 Reflections on the Call to Prayer, Come to the Mousqe? So, I'm sitting in my office listening to the Call to Prayer and sad that the sound of it is overshadowed by the on-going drilling, pounding and hammering on the 70 story (it seems like!) monstrosity going up across the street. In point of fact, it only has like 7. But, that's in a neighborhood where almost nothing is taller than 3 stories. And then the familiar tones of the AllahuAkhbar finish. Well, what now? I'm treated to the tones of some recorded voice saying something I can't understand. Thankfully this one is short. The one that I find rather offensive is the 4 am one. Not the Call, that's great. But, the 30 minute serenade, if you will, that is played in advance. Yes, 30 minutes BEFORE the actual Call to Prayer, we are treated to music and a sermonette, I guess. As this has begun waking up the Beans, I can assure you it grates on every nerve I have. And, yes, I've heard it ALOT lately. I complained back when the neighborhood mosque introduced chanting or singing or whatever immediately after this self-same Call to Prayer, but apparently that wasn't enough. They needed to provide sleepless nights and neighborhood disharmony by disturbing the peace a full half hour before the Call. I'm sorry, but that's just rude. Now, hearing the Call to Prayer issuing from the mosques is one of the unique and very beautiful things about living in a country like Jordan. When we first moved into our office the afternoon Call to Prayer was about my favorite time. On the hill outside the back (now overgrown with aforementioned horrible building), we'd get the Call in stereo from mosques all around the surrounding hillside. Now, the surround sound is blocked. But, I still love the haunting tones of the Call. It's a shame that some have decided that noise pollution is necessary turning this time of day from one of favorites to one of my least favorite... :(. Well, at least I still have a reasonable mosque near the office, so I can enjoy the strains of the Call without the noise pollution. I invite you all to this Mousqe. It should be an interesting time :). You know, the Beans are such a fickle and change-able lot. They kind of crack me up. I expect many of you are wondering from my blog post if El 3atal and I have hit a rocky patch, the fabled 12 year trouble or something. I assure you it is nothing nearly so dramatic. Yesterday, much to my rejoicing (and that of the beans who gave up swimming day at the day care to go with us) we went to the airport to pick up HelperBean. All of my fears were not realized (although I had every confidence that once she had given a commitment, she would be back, I also have the Mommy-sense to imagine having to leave her son again...) and HelperBean arrived in the morning at much derided QAIA... May I say that the entire family is rejoicing?! Finally someone will be able to sort out where Back-up Helper has been putting all of that stuff that we haven't been able to find in a month. Finally, we can actually make it to work at a reasonable hour. Finally there's someone else to help deal with whining and puking (hopefully we're finally over that!). So, needless to say, my life has come back into some sort of reasonable orbit. It's no longer spinning nearly out of control. And then, the other shoe dropped. For the last 3 weeks, JujuBean has spent nearly 100% of the time that she and I are collocated attached to my hip. She constantly grabbed my hand with cries of "Mommy, I want you, I love you." She even said to me on several occasions "Mommy, I never want you to go away from me again, at all." Talk about hyperbole. And then, Helperbean's much lauded, long awaited return occurred. And now, guess what... Mommy can't do ANYTHING for JujuBean. From brushing teeth to putting in hair bobs from getting breakfast to buckling in car seats, JujuBean only wants HelperBean. This morning, I finally decided JujuBean could stand a little teasing about this transfer of affections. I said to her, "I think you don't love Mommy anymore." She replied "yes, because I love HelperBean." How refreshingly honest! I had to giggle about that one. She is as firmly not my little girl as she could be. Somehow, I know that the balance will swing back to the middle after a month or so of HelperBean availability, but how quickly they transfer allegiance :). And, while I'm on the subject, I'd like to reflect for a brief moment on the blessings we've had since HelperBean was gone. MemeBean has been with us for an extended visit. This has been wonderful as the kids take TetaBean's presence for granted we're blessed with seeing her so often. But, MemeBean is just much farther away. So, we've been having fun with another influence, someone else. And, she's helped MommaBean not go nutso. I've spent alot more quality time with the kids than I have in the 2 years since we've lived in Jordan. Admittedly that's been a mixed blessing as it also drives me nuts, but it's so fun to see my little bitty Beans growing and maturing. It's also added a closeness that feels so awesome to the whole family unit. I've reminded myself that if I have to, I can in fact do it on my own (I hope never to have to, but...). I've been rather self-reliant, extending all the way to actually mopping the office floors myself. I even managed to make cupcakes and brownies for our T-Ball final game/party/awards ceremony (boy did we miss Lil Kinz!). I braved my fickle oven and turned out snacks that went far beyond edible all the way to scrumptious. Battling constant yuckiness (illness) has reminded me to give thanks to God that we're all generally so very, very healthy. Having loved ones leave gives us something to look forward to. Now that HelperBean is back, we're going to create a new calendar to mark the days on for when JujuBean's best friend comes back. Next, we'll begin marking a calendar for the return of the Konouz. So, the joy and tragedy of anticipation is coming at full force. What an awesome lesson to learn so young!